What Would A Sanders’ Presidency Look Like? While most of the media understandably remains fixated on the horse-race aspect of the presidential contest (“Bernie’s surging!”), a few intrepid journalists are daring to think the unthinkable: what if Bernie actually won the election? What would a Sanders presidency look like? This is an important question, not least because how one answers it goes a long way – or should go a long way – toward determining whether one will vote for Bernie. In interviews with Vice’s Mike Pearl (that’s the website, not the anti-prostitution arm of the Vermont State Police), my colleague Bert Johnson and I engaged in some admittedly speculative musing about a possible Bernie presidency. Of course, the immediate problem one faces in trying to anticipate what happens when the “face of grouchy stoicism” became “the first avowedly socialist president in United States history” is to understand how it happened. Obviously, if Sanders overcomes deep odds to become President, something entirely unprecedented in the political system occurred – but what? Did Hillary’s candidacy implode after investigators found the smoking email, leaving Bernie to win by default as the last candidate standing? Or did the American electorate exhibit a shift leftward, essentially deciding the time was ripe to adopt Bernie’s long-standing progressive principles? And if the latter, how big were his coattails? Did the Senate turn blue? (Possible, but unlikely.) The House? (Even more unlikely.) Answers to these questions go a long way toward determining the contours of a Bernie presidency. It is one thing to predict, as Pearl suggests (tongue-firmly-in-cheek) that in the aftermath of a Sanders’ victory “college students are taking celebratory bong rips” – quite another to know whether the new Congress is going to raise marginal tax rates on the wealthy, or pass Bernie’s education reform bill. Of course, as both Bert and I suggested, we know a good deal about what Bernie’s domestic priorities will be, even if we can’t be sure how successful he would be in implementing them. As Bert notes, Sanders has been singing the same tune about the corporate overlords and income inequality for several decades. And he hasn’t missed a chance to hammer home those themes during his campaign speeches and on social media. As a result, I feel quite confident in suggesting that President Bernie will push to raise taxes on the wealthy and would try to address campaign finance reform. He’s also likely to work at raising the minimum wage. Bert pointed to efforts to address the student debt crisis. The biggest clue missing from this attempt to forecast a Sanders’ foreign policy, however, is knowing who he will turn to for foreign policy advice, and how he will structure his national security advising process. As I suggested to Knox, the two questions I would ask candidate Sanders on this topic are: “Who are you going to listen to on foreign policy? How will your organize your foreign policy process?” In thinking about these questions, I am reminded of this excellent Washington Post analysis of the Obama foreign policy decision-making process (hat tip to Jack Goodman) which shows how, on crucial policy decisions, Obama increasingly sought to bypass the foreign policy establishment in favor of centralizing decisionmaking within his own White House Office. As I’ve discussed in my book Bitter Harvest, this pattern of White House centralization did not start with Obama; it has been a growing trend among recent presidents. And while the propensity among recent presidents to want to exercise tight control of foreign policy is understandable, there are real costs to this strategy. As the WaPo critique of Obama’s foreign policy process suggests, White House centralization also makes less likely that presidents are going to hear dissenting voices, particularly from experts whose views may clash with that of the president’s closest political advisers. When it comes to assessing presidential candidates’ preparation for the White House, issues of institutional organization and process typically take a backseat to journalists’ concern regarding where candidates stand on the issues. This is unfortunate. As the critique of Obama’s foreign policy process suggests, and as President Bush discovered in his effort to direct the response to Hurricane Katrina a decade ago, a president’s legacy often turns less on what he believes and what issues he pursues than it does on how well he chooses and manages the officials who work on his behalf. Let’s hope journalists push Candidate Sanders on these managerial issues, so that President Sanders doesn’t have to learn their importance in the heat of a crisis. We will all be better off if Sanders gives these managerial issues some careful thought before entering the White House. How Much Should BlackLivesMatter to Bernie? By now, most of you have heard of the recent effort by members of the BlackLivesMatter (BLM) movement to disrupt a Bernie Sanders’ campaign event in Seattle. For those of you still caught up in Deflategate, here’s a video of the interruption – jump ahead to the 2:40 minute mark to see the point at which the protesters walk on stage which, eventually, prompts Bernie to leave. This disruption follows on the heels of last month’s confrontation at Netroots Nation between the BLM activists and the more economically-oriented progressives that are the core constituency in the Sanders camp. The ongoing disruptions have attracted more than their fair share of media coverage as journalists try to gauge the implications of this apparent split in the progressive wing of the Democratic party for the Sanders presidential campaign. In responding to journalists who have asked me about this, I have tried to make two points. First, to a certain extent Sanders is a victim of his own success, a point Clare Foran addresses in her National Journal piece on Bernie. The decision by the participants in the BLM movement to target Bernie’s campaign events are surely influenced by the tremendous crowds he has been attracting in recent days – crowds that are predominantly composed of Bernie’s core constituency: educated, affluent white liberals whose views the BLM movement is targeting. As Bernie gains more media attention, the payoffs to the BLM crowd for disrupting these events becomes proportional bigger. My second point is that we should not be surprised that Bernie and his supporters are, to a certain extent, somewhat miffed about the BLM disruptions and, in part because of this, were somewhat slow to react in a positive manner. As Colin Daileda notes in this Mashable piece, members of the BLM movement aren’t necessarily Bernie’s natural allies – something that I suspect initially puzzled Sanders, particularly given his civil rights record. From Bernie’s perspective, the types of issues that he has championed, from repealing Citizens United to raising the minimum wage to pushing for single-payer health care system are precisely the issues that, if implemented, would disproportionally help lower-income voters, particular African-Americans who are suffering from among the highest unemployment rates of any voting bloc. How useful can it be to disrupt the campaign events of the one candidate who is doing the most to advocate on your behalf? For those in the BLM movement, however, Bernie’s focus on economic issues does not address the racial justice concerns that are of particular importance to the leading activists in this movement. As Van Jones, a former White House adviser to President Obama, argues in a particularly scathing criticism of the Sanders’ campaign, “Our economic problems include an unemployment rate that is double that of whites, racially biased policing and court systems, predatory lenders who deliberately target black neighborhoods and public schools that expel black children at staggering rates for minor offenses.” For the BLM movement, these issues of racial justice are different from and transcend what they see as the Sanders’ campaign more narrow focus on economic inequality. So where does this leave Bernie? The Sanders’ campaign is struggling to broaden its appeal beyond the aging hipsters, college students and left-wing professors to attract support from more moderate and conservative Democratic voters that right now are supporting Clinton and who typically constitute about half the Democratic nomination electorate. It’s not clear how having to respond to disruptions from BLM movement is going to help Sanders accomplish this goal if the effect is to highlight views not shared by those more moderate Democrats. On the other hand, as I have noted repeatedly, Sanders is going to need to attract some support from minority voters if he hopes to compete with Clinton outside of Iowa and New Hampshire. To date, however, Clinton continues to hold a commanding lead in the polls among nonwhite likely Democratic voters. The key for Sanders, then, is to effectively fuse his message of economic justice with the BLM’s concern for racial justice in a manner that appeals to more moderate Democrats as well as racial minorities. But this is easier said than done, particularly when issue activists in both camps express reluctance to subsume their own views on behalf of a broader cause. In this vein, it’s worth remembering that those $50 campaign contributions the Sanders’ camp is proud of citing aren’t coming from Joe and Jane Sixpack – they are flowing in from ideological purists who expect Bernie to spread the gospel of economic progressivism. And they want to get what they paid for. “Presidential candidate Bernie Sanders is gaining legions of new admirers by shamelessly pandering to voters who want to hear the truth, critics of the Vermont senator say. According to those critics, Sanders has cynically targeted so-called ‘truth-based voters’ to build support for his Presidential bid. But while Sanders’s practice of relentlessly telling the truth might play well in states that are rich in truth-based voters, like the early primary states of Iowa and New Hampshire, critics say that his campaign could stall in states where the truth has historically been less important, like Florida. *My apologies for not linking to the Borowitz piece in my original post, and thanks to those who pointed this out. Bernie Sanders may be getting trounced in the national polls by Hillary Clinton, but you wouldn’t know it judging by his followers’ media presence. I was up yesterday on Los Angeles radio station KPCC’s AirTalk with host Larry Mantle (shortly before their segment on best dive bars in L.A.!) to discuss still another well-attended Bernie event, this one taking place in L.A. the night before, when about 25,000 people attended either in person or watched outside the LA Sports arena in which Bernie spoke. Every caller to the radio show was a Bernie supporter, and almost all raved about Bernie’s “electric” presentation to his passionate supporters. I have written and talked previously about the fact that Bernie’s support among Latinos and African-Americans still lags relative to Hillary’s. Here’s a chart put together by Philip Bump based on Gallup polling that shows the relative favorable/unfavorable numbers of the various candidates among African-Americans. Bernie has attracted large crowds before, of course, but they were in places like Portland, Oregon; Seattle, Washington; and Madison, Wisconsin – bastions of white liberalism that are not exactly cross-sections of the more diverse Democratic electorate. However, several of the callers to Mantle’s show took pains to point out the racially diverse composition of Bernie’s Los Angeles’ audience. This may be the hopeful among the #FeeltheBern crowd looking at the audience through rose-tinted glasses, of course, but it is clear that Bernie is making a concerted effort to reach out to non-whites in anticipation of competing in the contests beyond Iowa and New Hampshire. It is important to remember that although Bernie has lower favorable ratings than Clinton among African-Americans and Latinos, it is also the case that 60% or more of these groups don’t really know who he is. 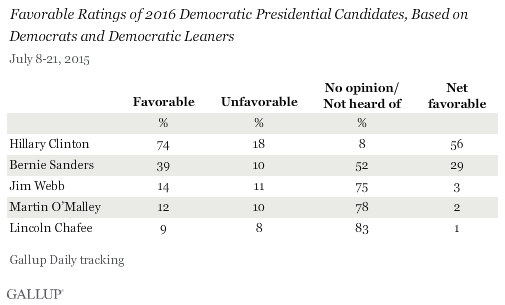 When you look only at those who express a favorable or unfavorable view toward Bernie, his percentage of favorable support comes closer to matching Clinton’s. It will be interesting to see how much ground Bernie can gain among these voters in the months to come. Meanwhile, in a reminder that no good deed goes unpunished, my last post cautioning readers to be wary of drawing conclusions based on one poll has been drawing its fair share of criticism in light of a more recent Boston Herald/Franklin Pierce poll that has Bernie leading Clinton 44%-37% in New Hampshire among 442 randomly selected likely Democratic presidential primary voters. The survey was in the field August 7-10, and has a margin of error of +/-4%. Since I received a few emails after my last post asking me to clarify the difference between a “statistical tie” and what the New York Times mistakenly (in my view) called a “dead heat”, I thought it might be useful to present the latest poll results visually, using a nifty app developed by Nicholas Neuteufel that graphs the polls results, including the margin of error. Are Bernie and Hillary in a Dead Heat in New Hampshire? At the risk of nitpicking, however, I would argue that a “statistical tie” is not the equivalent of a “dead heat”, The Times’ headline notwithstanding. To understand why, one should also ask: what is the probability that a purely random sample of 274 likely Democratic voters (the size of the WMUR poll on the Democratic side) would show Clinton ahead by 6% if in fact there is no difference in polling support between Clinton and Sanders in the underlying population – that is, that they really are tied? It turns out that it is not very likely – in fact, a simple test of the difference in survey sample results suggests there is a less than 10% probability that the race is actually tied, given the survey findings showing Clinton ahead by 6% (and making certain other assumptions about how the WMUR poll was conducted.) So, it is true that we can’t be sure that Clinton is ahead, at least not using the conventional 95% uncertainty level. But it is much more likely, given these poll’s parameters, that she is leading Sanders than that they are in a true dead heat. My quibble with most of the media stories reporting the WMUR poll is that they don’t make the difference between a “statistical tie” and an actual tie very clear. Well, maybe. Again, it is useful to put this claim in proper context too. If you parse the polling numbers, the one-month change from a 43%-35% Clinton lead in early July to 42%-36% margin this week comes out to approximately a handful of respondents expressing a preference for Sanders rather than Clinton this month compared to last month. Now, this might reflect an actual change in the sentiments of the underlying population. Or, it might just be the result of picking up a couple more Bernie supporters in the random sampling process, even though there’s been no actual change in voter preferences. The bottom line is that we should be cautious about extrapolating that Sanders is gaining on Clinton based solely on a 2% change in the WMUR polling results across a one-month period. 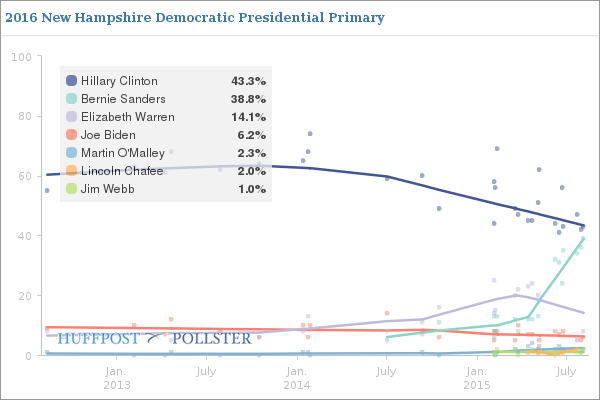 This doesn’t mean Bernie hasn’t gained ground on Hillary in New Hampshire. As this Pollster.com poll aggregation shows, if we widen our time horizon it’s clear that Bernie has closed the polling gap, particularly when Elizabeth Warren’s name was dropped from the survey options. But there hasn’t been a lot of recent polls in New Hampshire. A NBC poll in late July had Clinton up by a larger margin, at 47%-34%, while a recently-released Gravis poll has it 43%-39% in Clinton’s favor. (I haven’t looked closely at the internals of either poll.) Right now the aggregate Pollster polling has Clinton up 43.3%-38.8%. RealClearPolitics, which uses a slightly different aggregating algorithm, has Clinton with a more substantial lead over Bernie, at 44.8%-31.6%. 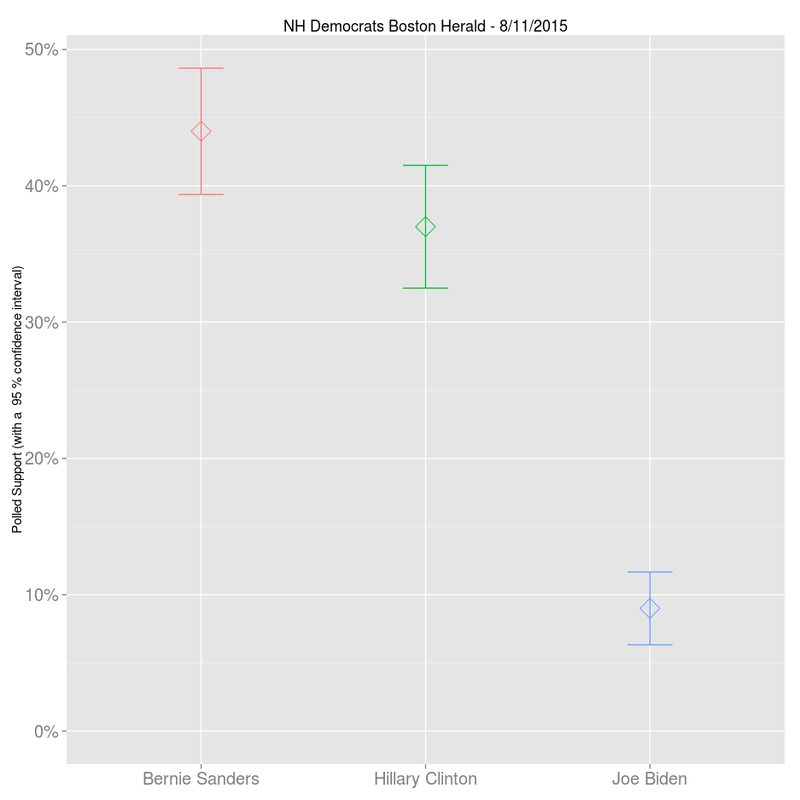 The bottom line is that rather than a “dead heat”, Clinton is probably leading Bernie in New Hampshire, and that it is not even clear, despite an abundance of recent negative news coverage for Clinton and Bernie’s well-attended campaign events, that he has gained all that much ground over the last month. Alas, for a media with a vested interest in seeing a competitive race for the Democratic nomination, that narrative is probably a lot less interesting, even if it is likely to be a bit more accurate. As the graph shows, Hillary’s favorable ratings have plummeted from the high 60% to the low 40%, while her unfavorable ratings have inched back up to where they were before she became Secretary of State. Of course, no one expected Clinton to maintain those high ratings as she transitioned from Secretary of State to presidential candidate, but still…. . Similar stories are told in Iowa and New Hampshire, where Clinton’s favorables/unfavorables are also underwater. Why is this bad news? Because, as Chris Cillizza reminds us, “Presidential politics tends to be dominated by personality and how people perceive their candidate choices.” The plain fact is that Clinton is not very likable. Then there is the ongoing email saga. In the most recent development, the inspector general of the intelligence community found that some of the emails provided by Clinton included classified information, although there is some dispute regarding whether those items were classified at the time Clinton sent the emails. No matter – this latest tidbit fits nicely into the prevailing media narrative that the Clintons can’t be trusted because they see themselves as above the law. As a result, we have a spurt of recent news stories with headlines like “Is Clinton’s Tide Shifting?”, “Worrying Numbers for Clinton In Last Week of Polling” and “Four Poll Numbers That Should Unnerve Hillary Clinton”. Her conclusion? “In the biggest surprise of the race for the Democratic presidential nomination, this thoroughly implausible man, Bernie Sanders, is a sensation.” Yes, midway through the article Ball includes the usual hedges – Clinton is still leading in the polls, Bernie’s a longshot – but then there’s this: “Every Sanders crowd is full of die-hards like Bailey [a Bernie-supporter Ball interviewed], passionately committed to their unlikely hero. Every Clinton crowd, on the other hand, is full of lukewarm rank-and-file Democrats who will not hesitate to tell you they have some qualms about supporting her.” Ouch! To those on the Left, particularly those disappointed in what they see as Obama’s lukewarm embrace of progressive ideas, Bernie is a man whose time has come. As my colleague Bert Johnson points out, if you look at Bernie’s stump speeches from the early 1990’s you will find them interchangeable with what he is saying now about corporate power and economic inequality. What has changed is that Bernie’s message has now found a willing audience. Or so the prevailing media narrative would have one believe. The problem with both these narratives is that they run up against stubborn facts. One is that candidate likability, Cillizza’s pronouncement notwithstanding, isn’t a very important influence on the vote, a point I’ve made multiple times before. Favorable/unfavorable ratings may be slight more indicative, but as Brendan Nyhan points out (see the chart above), her “favorable/unfavorable ratings at the national level have not changed as drastically as the coverage suggests. They averaged 47 percent favorable/45 percent unfavorable in January and are at 44 percent favorable/48 percent unfavorable now — a relatively modest shift given the onslaught of negative coverage” she has received of late. Moreover, if you unpack the trajectory of Clinton’s favorable/unfavorable ratings, you will see that her rising negatives are almost entirely rooted among Republicans and independents. Among Democrats she is both better known and viewed more favorably than any other Democratic candidate, including Sanders. On the other side of the narrative, Sanders may be a “sensation”, but he continues to trail Clinton in both Iowa and New Hampshire according to the polls – and these are the two states that seem demographically among the most favorably disposed toward him. (In a transparent bid to lower expectations, the Clinton campaign is openly suggesting Bernie could win both states.) Once the campaign moves south, particularly on Super Tuesday, Bernie is going to be traversing decidedly less favorable terrain. 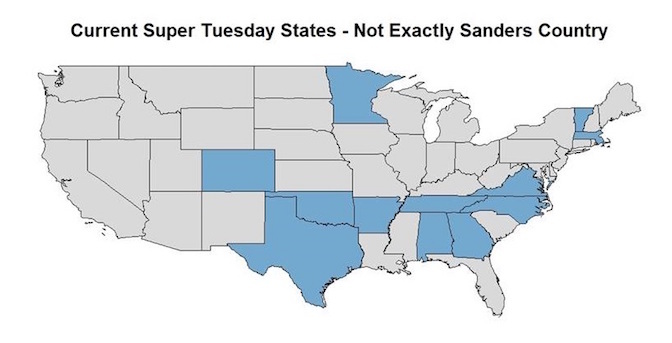 As this chart from RealClearPolitics shows, many of the delegate-rich Super Tuesday primaries will be held in the South, in states with heavy African-American or Hispanic populations. As I’ve discussed elsewhere, Bernie has, so far, elicited less-than-robust polling support among nonwhites. Before my twitter and blog feed is inundated with negative comments from the #feelthebern crowd, let me remind my readers that I’m analyzing where the candidates stand right now, and not expressing a political preference regarding an outcome. As a longtime Bernie-watcher, I’m thoroughly enjoying his time, however brief, on the national stage, and I sincerely hope his run lasts beyond Iowa and New Hampshire if for no other reason than to see Bernie scowl one more time at another inane horserace question from Chuck Todd. Bernie is raising important issues – including concerns about the intersection of race and income inequality – that need to be discussed at the national level. But it is also the case that his “surge” in the polls is much more about pollsters dropping Elizabeth Warren’s name from their list of potential candidates as it is any discernible shift in support away from Clinton. It fits the media horserace narrative to speculate about the possibility, however improbable, that Clinton will stumble and Sanders will step in to steal the nomination. As of today, however, the facts say that is not going to happen. Bernie trails Clinton in all the important indicators; national polls, early state polls, fundraising and party endorsements. Is there something about Bernie? Yes. Right now, he’s losing.